William Penny Brookes was born in Much Wenlock in 1809 where his father was one of the local doctors. The family house is situated in Wilmore Street opposite the Parish Church. He left Much Wenlock to study Medicine at Guy’s and St Thomas’s Hospitals in London. Later he travelled to Italy with his brother John to study at Padua, a renowned school of medicine attached to the University. The medieval botanical gardens at Padua could also have been an attraction to the young medical student. In 1830 Brookes was in Paris to further his education in Medicine when he learnt that his father had died of typhoid. After qualifying (M.R.C.S and L.S.A.) in 1831, he returned to Much Wenlock to take over his father’s practice. 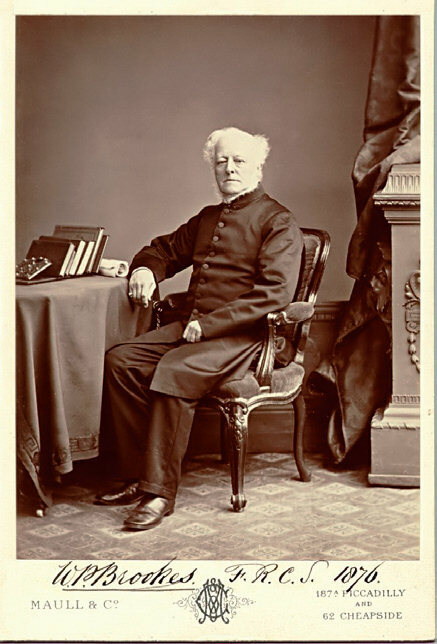 He became a JP in 1841 and remained an active magistrate for nearly 40 years. He would regularly have been confronted with cases of petty crime, drunkenness and theft in the local community. This would no doubt have influenced his desire to develop the need for structured physical exercise and education for the working classes. Brookes, again in 1841, founded the Agricultural Reading Society. This early kind of lending library was established ‘ for the promotion and diffusion of useful information’. He wrote to many titled and famous people, such as the Duke of Wellington and Abraham Darby. Many of them responded by sending donations and books. From the Reading Society evolved various classes including Art, Philharmonic and Botany classes. In 1850 Brookes formed the Wenlock Olympian Class.